Prime Minister Narendra Modi’s call to eradicate poverty in India by 2022, or in the next five years, is more of a political slogan than an informed prime ministerial promise. It is for sure now that close to 111 million Indians, or a bit more than 41 per cent of current poor population of India, would remain poor forever. The future has more shocks: studies show that poverty is getting transmitted to the next generation. 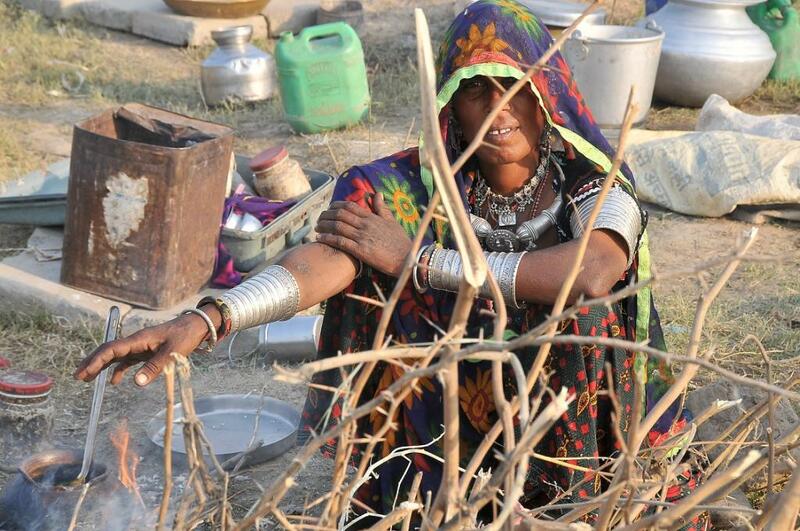 This means a vicious cycle of poverty for close to 10 per cent of India’s population. On September 25, during the national executive meeting of the Bharatiya Janata Party, Modi made the promise that India would be poverty-free by 2022. This is one of the main objectives of the much talked about ‘New India’ vision. This ultimately appeared in the resolution of the national executive as well. There are a series of surveys, mostly not discussed or debated in popular forums, which have been pointing out that a significant number of poor in India are not able to escape out of the poverty trap, and most of these chronic poor belong to socially disadvantaged sections like the scheduled castes and tribes. “Studies done on the state of poverty in the 1970s and 1980s pointed out that close to 50 per cent of poor remained poor despite efforts to eradicate poverty. And more than just economic growth leading to eradicate poverty, these sections of people remained poor for various social and ecological reasons,” says Shashanka Bhide, director at Madras Institute of Development Studies. He has been researching chronic poverty in India. Going by the National Council of Applied Economic Research’s Human Development Survey, during 2005-2012, 41.3 per cent of India’s poor (both rural and urban) remained poor. Recently, the World Bank also reported that during 2005-2011, 40 per cent of the poor remained poor. India has 269 million poor and this is the estimate that government has accepted. So, the number of chronic poor, according this estimate, is 111 million. “Our study, in the form of more than 30 papers, shows that it would be very difficult for the chronic poor to escape the trap,” says Aasha Kapur Mehta, an economist with the Indian Institution of Public Administration. A three-decade tracking of poor households in rural India by the CPRC claims that those who are chronically poor may pass on poverty to their next generation. What’s more, people residing in tribal and forested areas are likely to remain poor forever, fomenting violent conflicts in future. Most of India’s forested districts are already dens of Maoists. The survey by CPRC explains the “two Indias”. “Why do some people remain poor for a longer period of time? Why do poor areas remain poor forever? These are the questions answered by the survey,” says Mehta, who led CPRC in India. The survey followed about 3,000 households for almost 30 years across the country. It adopted a three-pronged approach to poverty: what drives poverty, what retains poverty and what causes exit from poverty. CPRC has published 32 research papers explaining various aspects of poverty in India. It defines the chronic poor as people who remain poor through their lifetime. Analysis of the papers shows that at least 50 per cent of India’s poor are chronic poor. The survey identified 15 regions spread over six states—Odisha, Madhya Pradesh, Uttar Pradesh, Chhattisgarh, Bihar and Telengana–where poverty is getting concentrated and chronic. 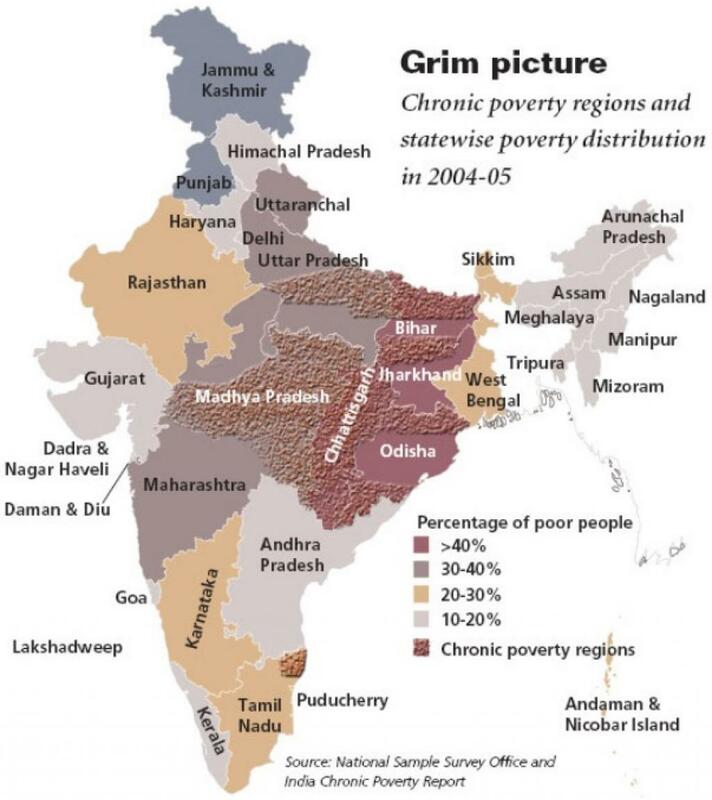 “Persistent backwardness and inequality have led to concentration of poverty in certain parts of India. So there is a geographical dimension to poverty,” says the CPRC report. The count of very poor (with a consumption expenditure of Rs 9 per day per person) is an indicator of chronic poverty. Though the number of very poor is decreasing, the percentage is quite substantial. Their number was 115 million in 2004-05—37 per cent of the total poor. Between 1983-94 and 2004-05, the percentage of very poor in the total population has declined in all states except Odisha. The percentage in Bihar, Madhya Pradesh, Maharashtra, Odisha, Tamil Nadu and Uttar Pradesh is higher than the all-India figure. The share of Bihar, Madhya Pradesh, Maharashtra, Odisha and Uttar Pradesh in the total population of very poor people rose from 57.5 per cent in 1983 to 66.8 per cent in 1993-94 and to 70.6 per cent in 2004-05. “This is alarming because the next generation of these people will also be poor. Thus a vicious cycle is created,” says Mehta. As per the survey, people in tribal and forested or degraded forest regions are more likely to remain poor forever. Nine of the 15 identified regions are forested; they have been targeted for poverty alleviation programmes since early 1950s. The report says, “In forest regions, the issues are not so much agronomic or natural conditions as poor people’s access to the resources that are there, their human capital endowment and the way they are incorporated into labour market.” The survey points out that the poverty reduction among tribals is slow. Estimates for 1993-94 and 2004-05 indicate that against a decline in poverty for the entire population from about 37 per cent to 27 per cent, the decline among the rural tribal population was from 51.9 per cent to 47.3 per cent. According to the survey, there is inequality in the efforts made to prevent people from poverty and get them out of it. The numerous poverty alleviation programmes are inadequate and insufficient. Of the 29 such programmes studied in the survey, only nine could prevent people from falling into the poverty trap. Thirteen could enable escape from poverty and 16 could alleviate chronic poverty. Consequently, says Bhide, a significant proportion of non-poor households may fall into poverty while a large proportion of poor may not manage to escape it. The surmise that chronic poverty would be carried forward to the next generation seems to be coming true. In July, the Oxford Poverty and Human Development Initiative released its report on poverty levels across the world. The report uses the Global Multidimensional Poverty Index that takes into account deprivations in health, education and living standards. Thus, according to this index, a poor person is called “multidimensionally poor”. Its findings based on data from across 103 low- and middle-income countries suggest that children represent 48 per cent of the multidimensional poor in the world. And half of India’s children are multidimensionally poor. In the Economic Survey of India, the government admitted that the poorest districts, where the most of India’s chronic poor reside, are getting proportional level of government funding. In fact, in the survey it admitted that distribution of government development fund has not been able to make an impact. But such admission is not new. Rather what is needed is a new thinking on poverty eradication, which, if achieved, can anyway ensure a New India, without poverty. Poverty eradication - Why do we always fail? Another major reason for the poor remaining in poverty is corruption. It is well known that the remoter the area (and likely the poorer), there is endemic corruption and the huge funds the government claims to have spent in these areas are mostly siphoned off. In such 'pockets of poverty' the sensible thing to do would be to get good NGOs to work on development with the local people. Government departments are incapable of doing so by training, mind set and also corruption. But it seems that the present government specially is hell bent of kicking out NGOs from where the poorest live.